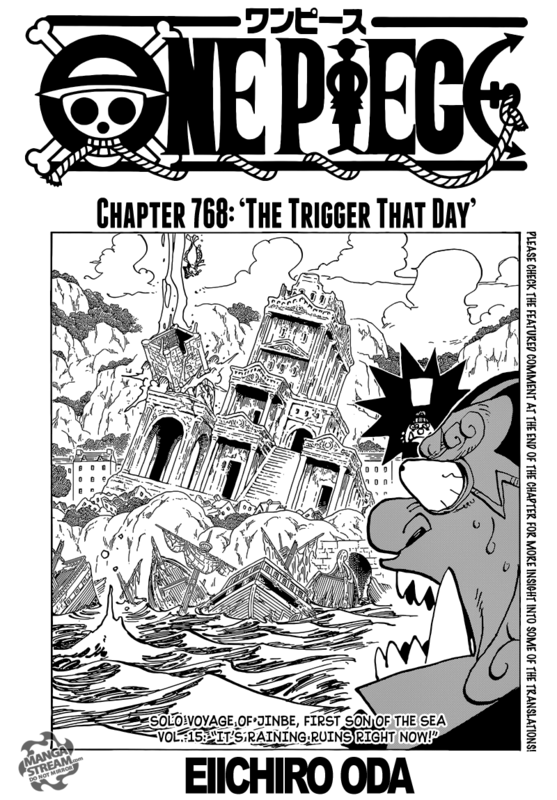 Law and Doflamingo clash, with Law thinking to himself that “he’ll be free once he defeats Doflamingo”. He asks Doflamingo “what he thinks of Monkey D. Luffy” and “what he makes of D”. 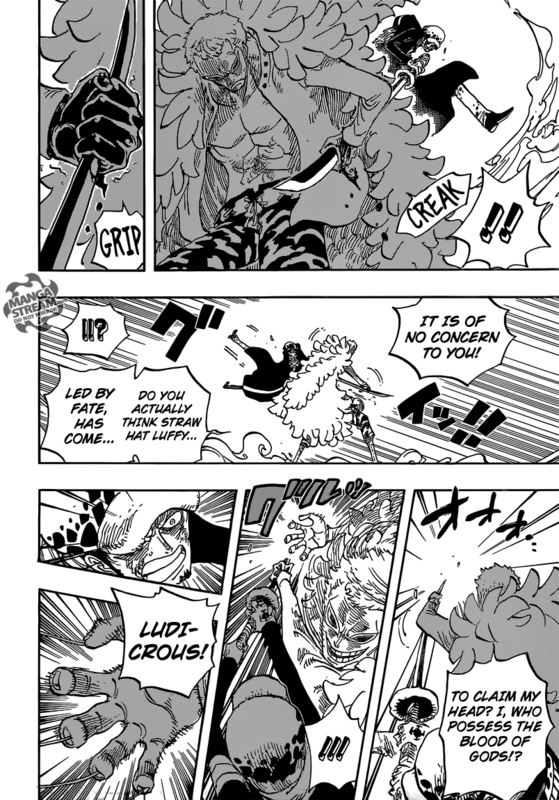 Law stabs at Doflamingo who catches the sword with haki. He asks tells him that “Luffy, a D. may have been sent there by fate’s will”. 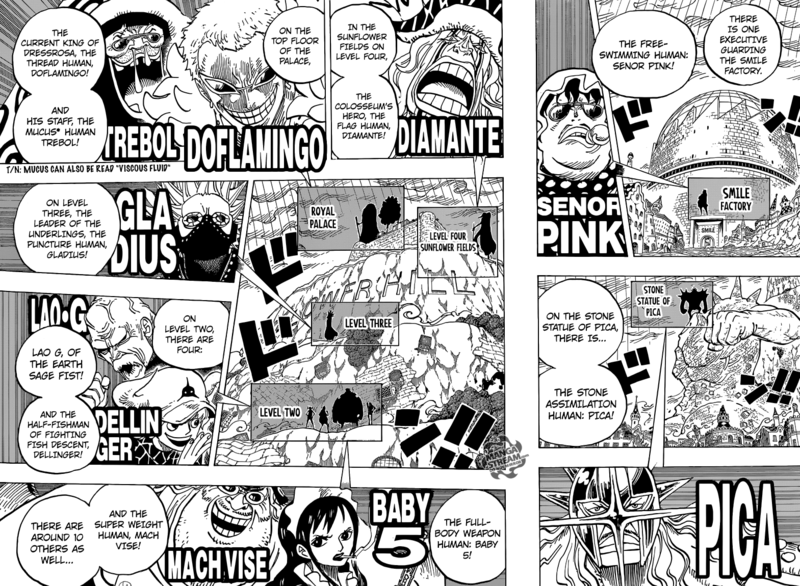 Law reveals that he is a D.
Meanwhile, Viola keeps watch of all the current battles and informs Usopp of the location of the fighters and who’s winning. The Colosseum combatants are failing in their fight against the Donquixote executives. Doflamingo, seems to be unimpressed with the lore of D.
He dismisses it as being a “silly superstition”. Trevor warns Doflamingo that “he’s within the D power’s sphere of influence”. The warning was too late as Law uses “Injection Shot”. He pierces him stating that “he had accomplished what Corazon had failed by shooting Doflamingo”. If I’m being honest I don’t care about any of the non Doflamingo fights. None of them are really interesting, so I wouldn’t mind if they complete them off page. I think that adding to the lore of “D”, is most interesting. Maybe in the next few chapters we’ll get more information about it. Ichibei notes will kill Yhwach for being so disrespectful, and not listening to him. 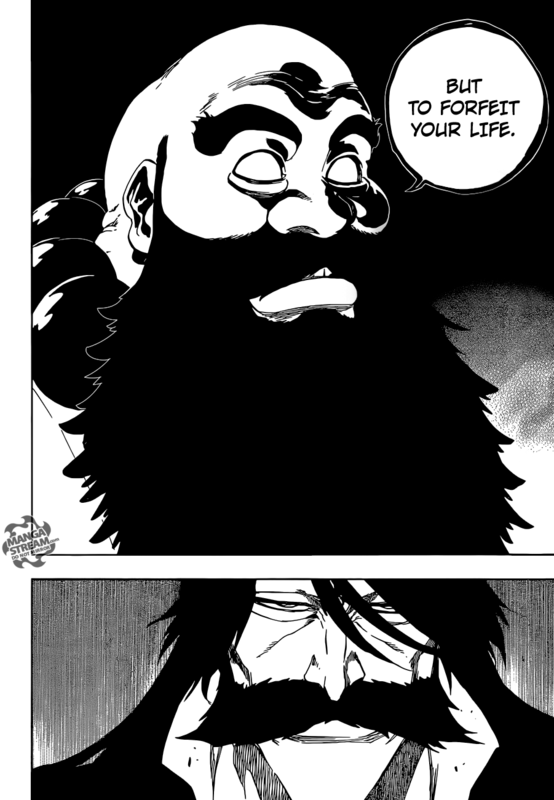 Ichibei says that he has no choice, but to make Yhwach “forfeit his life”. Elsewhere, Yushiro Shihoin ( the 23rd head of the Shihoin Clan ) searches for Yoruichi, while carrying a large wrapped object. Urahara draws a line in the ground, as he does Hiyori Sarugaki arrives. She asks him “if he did not finish his preparations inside the building”. When Urahara states that he “has already sent Yoruichi up”. Hiyori demands to know why he sent her up before they got there. She accuses him of believing “it is okay for Yoruichi and Ichigo to die as long as they slow down the enemy”. 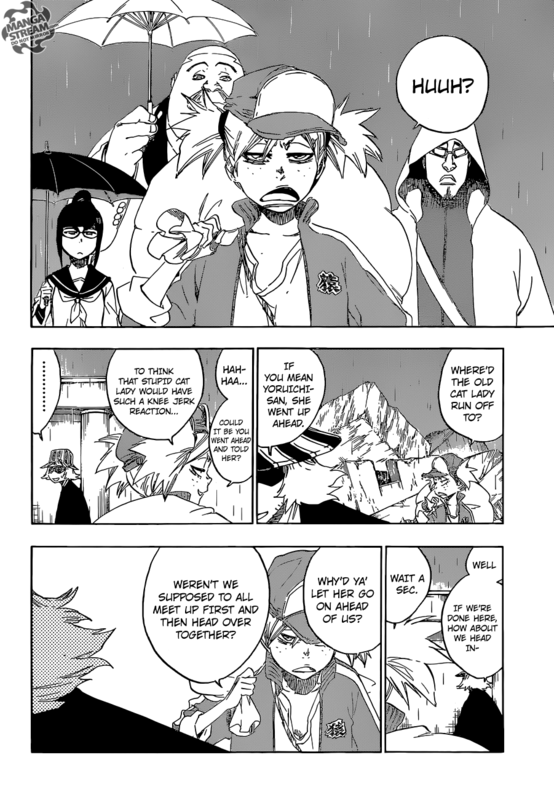 Yushiro interrupts them, and is saddened that Yoruichi is already gone. Urahara tells her “that whatever she brought will likely prove useful to them and begins walking inside”. We return to the “Soul King Palace”, Ichibei and Yhwach continue to fight. Yhwach tells Ichibei his demeanor has changed from very happy to more “ghastly” expression. Ichibei hits Yhwach with his brush, but he blocks it with his forearm. Ichibei to reveals his brush can “cut names” as Yhwach’s arm falls to his side. Ichibei ability “cuts” Yhwach abilities in half, he “changes” the name of his arm to “Ar”. Ichibei sends him flying backward with a single slash. When Ichibei asks him “how he feels about being cut to pieces, Yhwach grins and demands to know if he looks like he is suffering as Reishi gathers around him”. This chapter was pretty good. I’m interested in what Ichibei power actually is, or more accurately how it works. 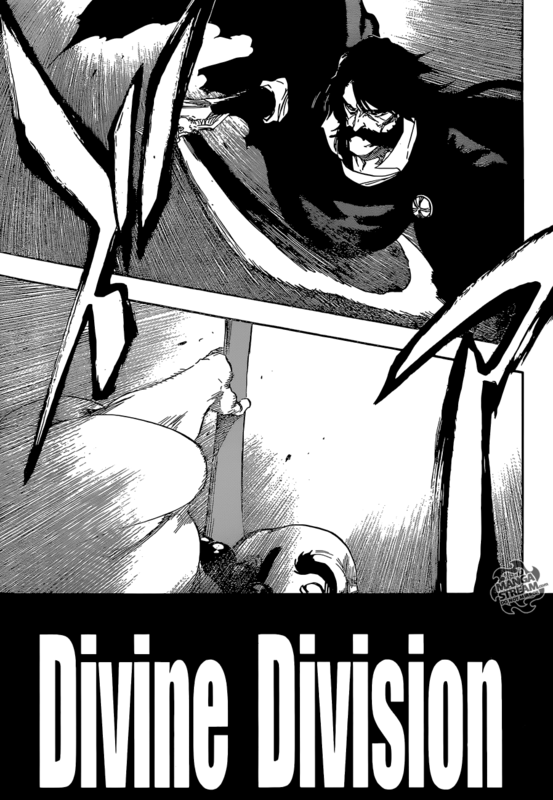 There’s NO way he wins this fight, but I can’t imagine how Yhwach escapes this. I’m always excited when Yoruichi and Urahara are involved in the story line. I’m hoping that we get to see their respective Bankai’s.